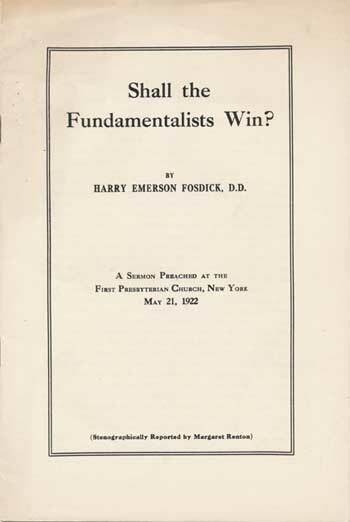 Content Summary: A small collection of original editions of Fosdick's sermons as issued by the Riverside Presbyterian Church, including the infamous "Shall the Fundamentalists Win?". Other materials in this synthetic collection include a representative assortment of critical works issued in response to Fosdick's modernist views. In addition, a link to Dr. Clarence E. Macartney's rebuttal, "Shall Unbelief Win?" is provided below in PDF. It was Fosdick's controversial and inflammatory sermon [see folder 12, below] in 1921 that many look to as the starting point for the modernist controversy that raged until near the close of the Depression era. Other events were certainly part of the larger story, but Fosdick's role in the controversy is clear. ƒ15—Fosdick, H.E., 1925, "The Farewell Sermon of Dr. Harry Emerson Fosdick to The First Presbyterian Church of New York, Sunday, March 1, 1925,"
1. "Christianity's Supreme Rival," preached at the Park Avenue Baptist Church, 13 Nov. 1927, 16 pp. 2. "What is the Matter With Preaching?," reprinted from Harper's Magazine, July 1928, 20 pp. 3. "Overcoming the World," preached at the Park Avenue Baptist Church, 18 November 1928, 15 pp. 4. "What Do You Say To Yourself?," from the October 1929 issue of The American Magazine, 16 pp. 5. "Christ and the Inferiority Complex," preached at Temple Beth-El, 20 October 1929, 14 pp. 6. "A Little Morality is a Dangerous Thing," at Temple Beth-El, Sunday 27 October 1929, 14 pp. 7. "Pull Yourself Together," preached at Temple Beth-El, New York, 24 November 1929, 14 pp. 8. "Handicapped Lives," preached at Temple Beth-El, New York, 19 January 1930, 13 pp. 9. "The Personality of Jesus - The Soul of Christianity," at Temple Beth-El, 13 April 1930, 15 pp. 10. "The Mystery of Life," preached at Temple Beth-El, New York, 4 May 1930, 15 pp. 11. "Moral Independence," preached at Riverside Church, New York, 19 October 1930, 15 pp. 12. "What Are You Standing For? ", preached at Riverside Church, New York, 30 Nov. 1930, 14 pp. 13. "The Ghost of a Chance," preached at Riverside Church, New York, 28 December 1930, 15 pp. 14. "Handling Life's Second-Bests," preached at Riverside Church, New York, 18 January 1931, 14 pp. 15. "Our Moral Muddle," preached at Riverside Church, New York, 8 March 1931, 14 pp. 16. "Personal Responsibility in the Present Crisis," preached at Riverside Church, 15 Nov. 1931, 14 pp. 17. "A Fundamentalist Sermon By A Modernist Preacher," at Riverside Church, 17 January 1931, 14 pp. 18. "Six Ways to Tell Right from Wrong," preached at Riverside Church, 30 October 1932, 14 pp. 19. "Personal and Social Religion: Part I - Christianity's Stake in the Social Situation," preached at the Riverside Church, New York, 20 November 1932, 13 pp. 21. "Superficial Optimists, The Peril of a Serious Time," at Riverside Church, 8 January 1933, 14 pp. 22. "Five Sectors of The Peace Movement," preached at Riverside Church, 10 January 1937, 13 pp. 23. "Are We Fit To Keep Our Democracy?," preached at Riverside Church, 2 June 1940, 13 pp. 24. "God Talks To A Dictator," preached at Riverside Church, 13 October 1940, 13 pp. 25. "When the Devil Looks Like An Angel," preached at Riverside Church, 27 April 1941, 13 pp. ƒ18—Burns, Vincent Godfrey, Fosdick and the Fundamentalists: A Review of the Great American Controversy in the Protestant Church (New York: The League for Public Discussion, n.d.), 13pp. ƒ20—Fountain, Charles Hillman, The Case Against Dr. Fosdick : A Reply to the Report of the Committee of the New York Presbytery Which Exonerated Him of the Charge of Teaching Doctrines Contrary to the Bible and the Westminster Confession of Faith (Plainfield, NJ : by the Author, 1924, Second and Revised Edition), 24pp. ; 18.5 cm. ƒ23—Morrison, Henry Clay [1857-1942], The Follies of Fosdick (Louisville, KY : Pentecostal Pub. Co., 1936), 45pp. ; 19cm. [photocopy]. ƒ26—Wyckoff, Albert Clarke, Review of The Modern Use of the Bible, in Christian Leadership, Vol. 1, No. 4 (July 1925) 3-6, 10-11. Fosdick, Harry Emerson, A Great Time To Be Alive: Sermons on Christianity in Wartime (New York: Harper & Brothers, 1944, first edition), hb, [viii], 235pp. ____________________, A Guide to Understanding the Bible: The Development of the Ideas within the Old and New Testaments (New York: Harper & Brothers, 1938, fifth edition), hb, xvi, 348pp. ____________________, The Living of these Days: The Autobiography of Harry Emerson Fosdick (New York: Harper & Brothers, 1956, first edition), hb, ix, 324pp.